Yes, Garlic. So recently I read the 100 Days of Real Food (great book, by the way) and started making a few of the recipes at home. We have already made huge progress with what we eat at home, but I needed to add a few new things to my recipe rotation. Many of her recipes call for fresh garlic. I have a love/hate relationship with garlic. I love the taste and how it makes my cooking so much more yummy, but I HATE chopping it, peeling it, and basically getting it into my food. I can never get the smell off of my hands. I hate that. I decided to solve this problem by taking a break from fresh garlic and buying that nice little jar of already minced garlic. Perfect solution to my problem, right? Epic fail! 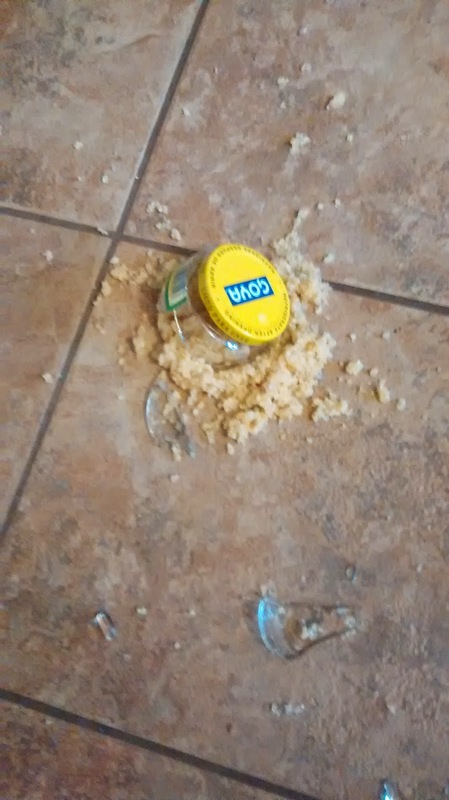 Nothing like trying to avoid garlic smell by buying a jar of garlic and then proceeding to accidentally drop it on its way back to the fridge...requiring me to clean up ten times the amount of stinky garlic with my bare hands. Bleck! Needless to say, looks like I am going to bed tonight with garlic scented fingernails. Have you ever baked a whole garlic in the oven? Deliious!